Dimension Stamps have a fantastic stamp set call It's a Date Calender set (ref: 2400070a) it can be used to make calenders, diaries, well anything that needs dates really. So I decided I would have some fun and make a journal using mainly this set and another Dimension Stamps set called Forever Floral (ref: 2400061a). 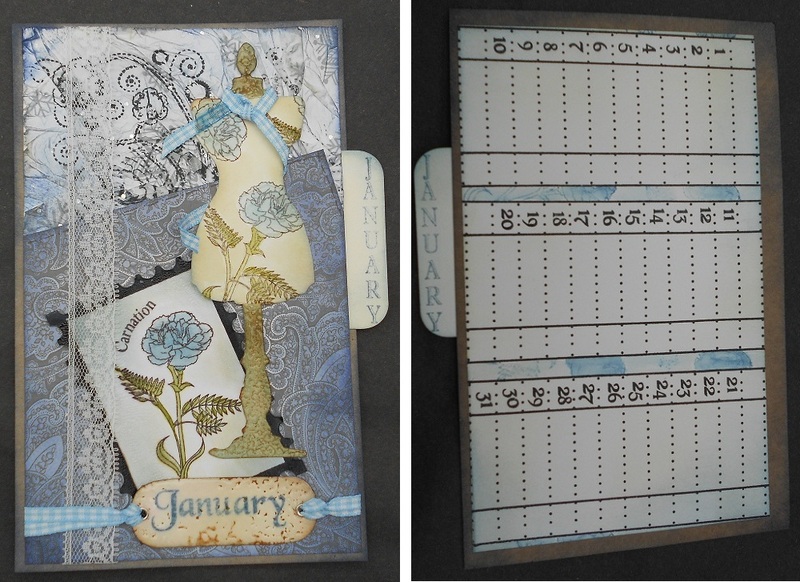 For January I created the background by scrunching up some tissue paper then sticking it to some card and flattening it out and stamped Time Flourishes Stamp (ref: 0605039A) onto it. I then chose some paper to complete the background and stuck this on. I then stamped the largest postage stamp from the Postage Stamp set (ref: 1808011A) and stamped the Carnation and it's word into it. I coloured in the carnation using distress inks and blackout the border of the postage stamp. Once it was dry I covered it in crackle paint. The dressmakers doll is a Tim Holtz die, which I cut out, masked off the "body" and using distress inks coloured in the post, I then masked off the post and stamped the carnation randomly, this was then coloured in using distress ink. Once dry I added glossy accents to the carnations and tried a ribbon around the "neck". To make the tag I stamped "January" and distressed it. I then embossed it using clear enamel, once the enamel was cool I distressed it again so any gaps in the enamel became really dark. 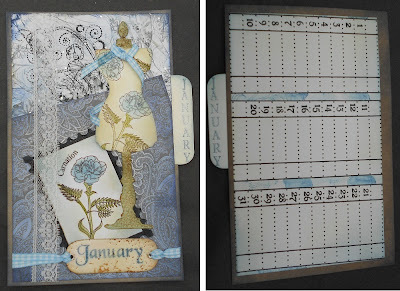 I did this again for the side tab using the vertical "January"
It was all finished off with some ribbons and lace. I have to admit this card did inspire my friends birthday card. 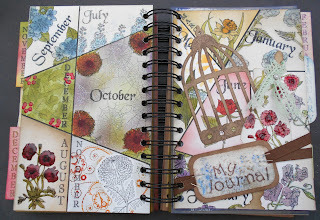 For the calendar part I stamped the grid across the page three time, added the numbers. Then I masked off between each of the grids and stamped the Carnation and coloured it in. February's page was so quick and simple to make I was shocked! To make the background I randomly stamped the Violet, then masked them of to add the grid and numbers making sure the 14th was visible. I then added "Valentines Day" from the Grand Word Perfect Set (ref: 1803161a). I then coloured this in. 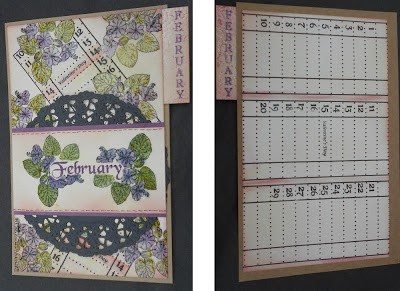 For the "banner" I cut a strip of card and stamped February in the centre. I then created a mask and stamped the Violet at each end, coloured in and distressed it. The along the two edges added fake stitches. I added this to some purple card and stuck it on a black doily and added it. I added glossy accents to the flowers. 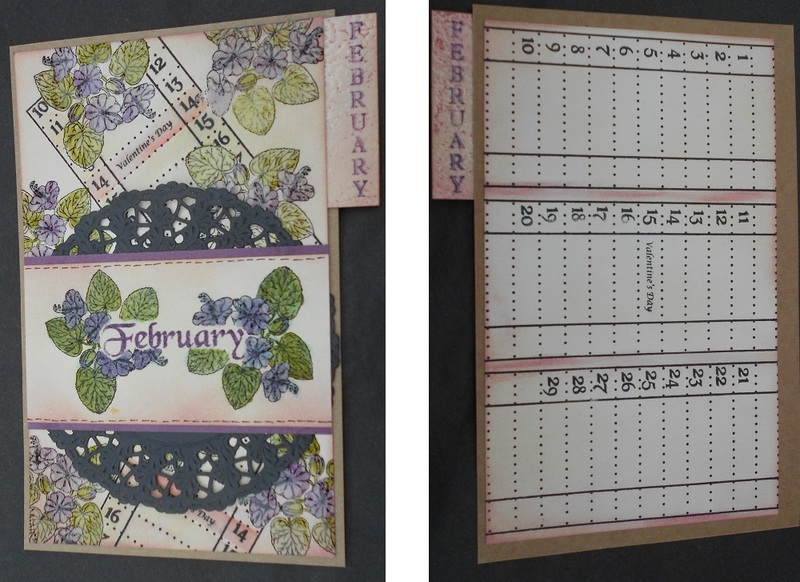 The calender part was distressed around the edges then between the grids. See, I said this one was quick! 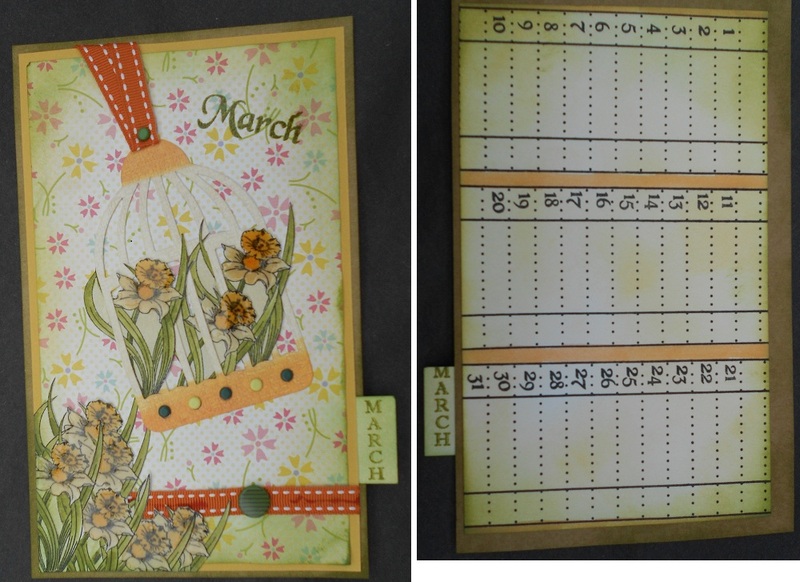 I just love Daffs, so I had lots of fun making March. To make this one I choose some spring time paper and distress around the edge. I then stamped the Daffs three times to go in the birdcage. Then in a corner I masked and stamped the Daffs. I then coloured these in and cut them out. I die cut the birdcage and coloured the top and bottom, then added the three flowers. Using brads I filled in the holes on the birdcage. To finish off I added ribbons and brads. 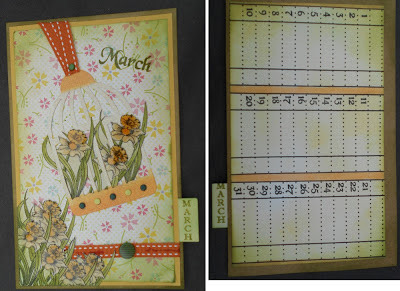 Then stamped "March" in the top corner. For the calendar part I just distressed it all over and coloured in between the grids. This would make a lovely Easter card! The other months will be following soon!